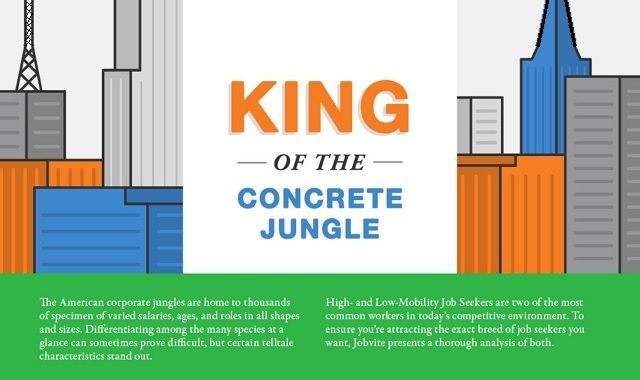 King of The Concrete Jungle #infographic ~ Visualistan '+g+"
The American corporate jungles are home to thousands of specimen of varied salaries, ages, and roles in all shapes and sizes. Differentiating among the many species at a glance can sometimes prove difficult, but certain telltale characteristics stand out. High-and-Low-Mobility Job Seekers are two of the most common workers in today's competitive environment. To ensure you're attracting the exact breed of job seekers you want, Jobvite presents a thorough analysis of both.